WHEN youngsters from a primary school were asked to dress up as their favourite book characters they let their imaginations take over. Characters from classic and modern children’s novels, comics and non-fiction books walked the corridors and learned in the classrooms of Mangotsfield C of E Primary School during its World Book Day event. With 19 classes and 570 pupils getting into the spirit of the event, there was a wide array of heroes and villains, witches and wizards, Olympians, superheroes, giants, aliens and even a few crocodiles and rats. The school made its book day part of a week of events including a book fair, book swaps in class and an evening bedtime story session where key stage one youngsters came back to school in their pyjamas to be read a story in class, along with a cup of hot chocolate and a biscuit. Assistant head teacher Kirsty Croasdale – who dressed up as Winnie the Witch for the day – said: “As we have done it more and more each year, the more members of our school family have become involved. 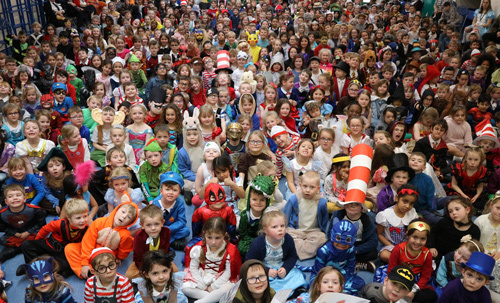 “Even the reading assistants and support staff dress up – we had Miss Trunchbull in the front office – and it helps to make the event that much more exciting for the children. The school held a competition to find the best costume, with plenty of work going in to some imaginative and inventive entries. The winners – chosen with some help from the Voice – included Mr Impossible, Gangsta Granny, Peggy from Swallows and Amazons and a robot with a bird living in his heart, from The Robot and the Bluebird.